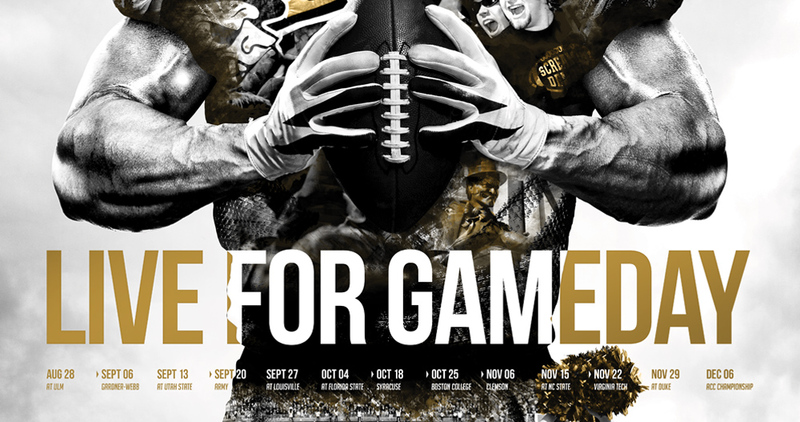 Initiated in 2003, the National Association of Collegiate Marketing Administrators (NACMA) Best of Awards program honors outstanding achievement in marketing and promotions. Awards are presented in 13 categories, with each category divided into three groups based upon school size and conference affiliations to promote fairness. Nearly 1,000 entries were received. Thank you NACMA for this great honor! The Educational Advertising Awards is the largest educational advertising awards competition in the country. This year, over 2,000 entries were received from over one-thousand colleges, universities and secondary schools from all fifty states and several foreign countries. Wildfire was recognized by the judges with one Silver and two Merit awards granted to Wake Forest University and University of North Carolina School of the Arts. Competitive Carriers Association (CCA) was founded in 1992 by nine rural and regional wireless carriers as a carrier centric organization. Since its founding, CCA has grown to become the nation’s leading association for competitive wireless providers serving all areas of the United States. Today, the licensed service area of CCA’s over 100 carrier members covers more than 95 percent of the nation. Lowes Foods, along with award-winning branding expert Martin Lindstrom, approached Wildfire to assist in bringing Martin’s one-of-a-kind shopping vision to life through an in-store experience unlike any other in the category. Wildfire helped concept, design and implement a variety of store-within-a-store environments, including The Chicken Kitchen, SausageWorks and The Cakery. Each of these experiences—from the fun and folksy one-stop chicken shop, to the wonderfully wacky SausageWorks professor, and the sweet, sugary, square-filled Cakery—has its own distinct personality and offering, giving shoppers a more memorable and enjoyable all-around experience. David defeated the giant Goliath with a big idea and a little rock – the sort of thing small firms do each year. The annual International Davey Awards is tauted as the largest and most prestigious awards competition exclusively for the “Creative Davids” of marketing, who derive their strength from big ideas, rather than stratospheric budgets. We’re happy to announce first and second place honors for TV and video created for the Dixie Classic Fair, Allegacy Federal Credit Union and Wake Forest Athletics. 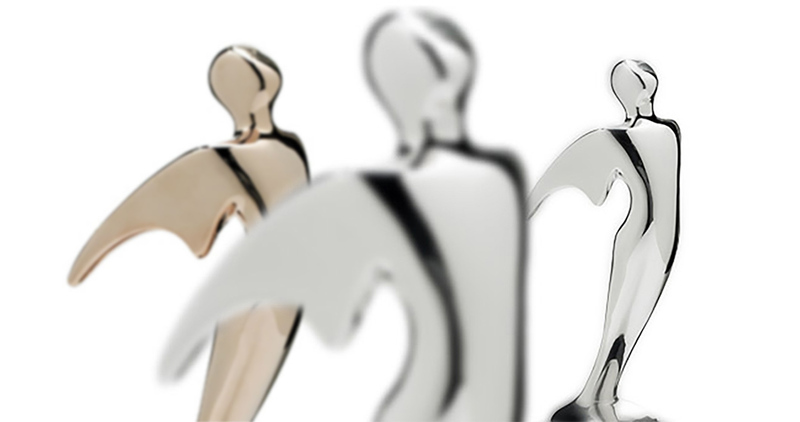 The Telly Awards honor the very best film & video productions, groundbreaking online video content, and outstanding local, regional, & cable TV commercials. The Dieline, the world’s top package design website, has once again recognized Wildfire for its packaging work. The new Blue Ridge brand looked to Wildfire to create labels for mouth-watering appeal. 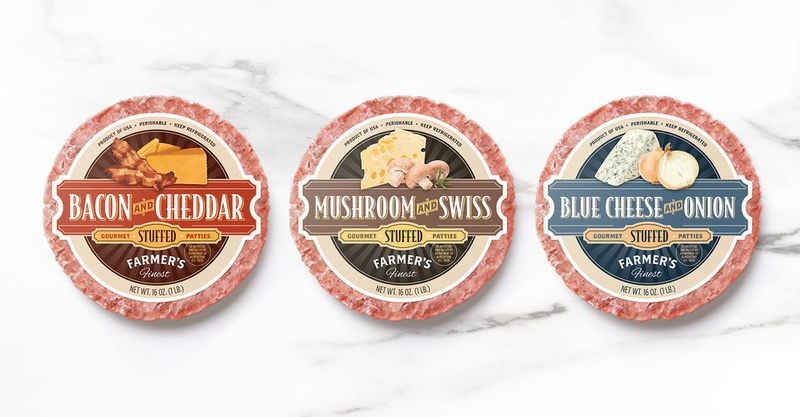 Three gourmet burgers have been created so far – Bacon & Cheddar, Mushroom & Swiss, and Blue Cheese & Onion – and come deliciously pre-stuffed, ready for grilling! 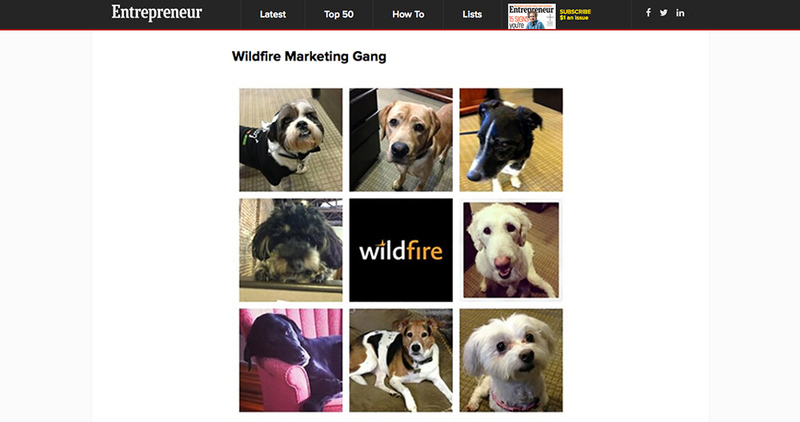 Entrepreneur.com selected 25 submissions for their “Do Pets Make the Best Co-Workers” piece, among them a collage of the Wildfire dogs. Gus, Ham, Buddy, Enzo, Zach, Bodhi, Finn and Bella are some of the hardworking dogs that enjoy coming here with their people. It’s one of the many things that makes our office so unique! Wildfire has partnered with two other locally-owned businesses, Workplace Strategies and Storr Office Environments, to introduce Flywheel. Flywheel is an 11,000+ square-foot co-working space located in the Wake Forest Innovation Quarter at 525@Vine and will be open 24/7 for innovative professionals to come together to work on the fly, learn and share knowledge. 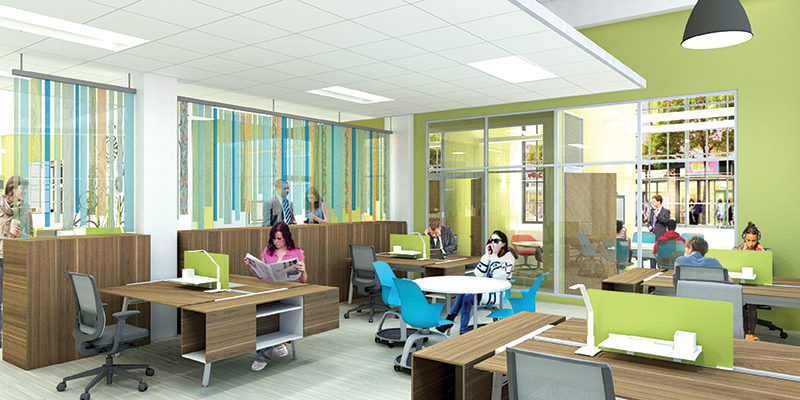 Opening in June, there will be flexible short and long-term membership plans, including day passes, for open and enclosed workspaces. To learn more about Flywheel, visit www.flywheelcowork.com.